Layering rugs is really not a new idea. It’s been around for centuries! 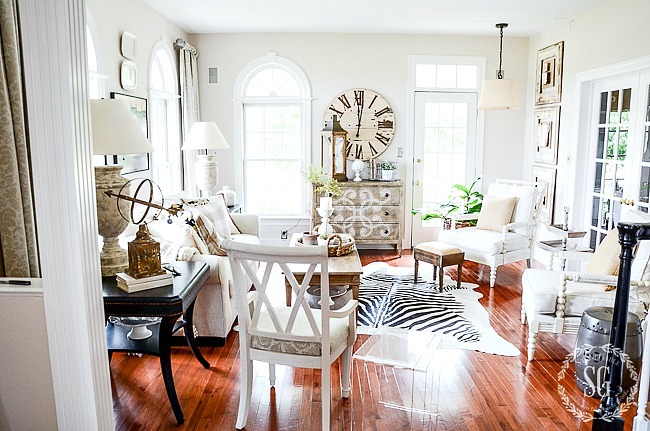 But we are seeing a lot of gorgeous rug layering on the decor front and I’m loving it! 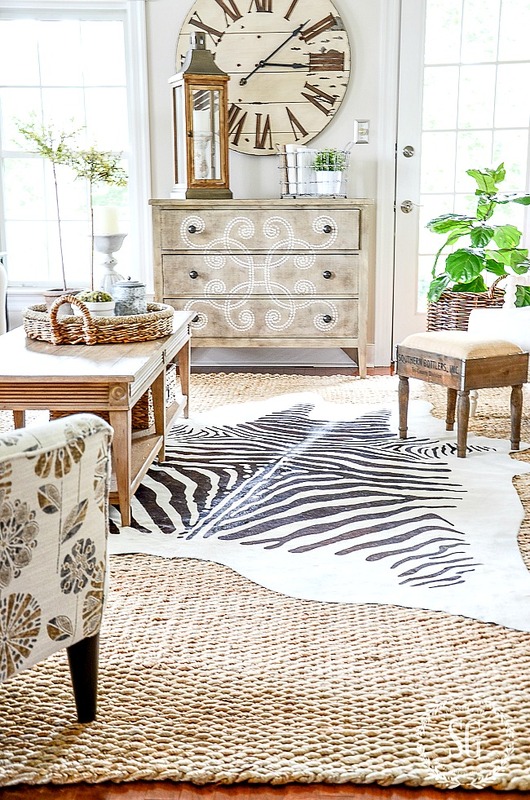 Adding one rug on top of another adds lots of texture for our eyes and that personal, one-of-a-kind statement that makes a room reflect who we are! 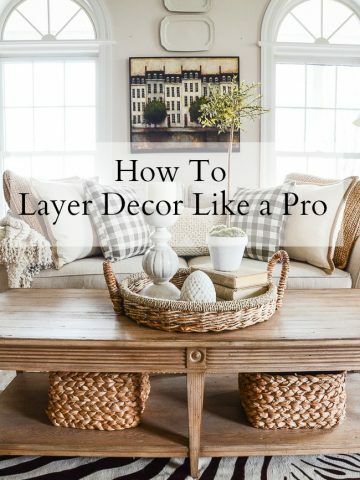 Today let’s learn to layer rugs like a pro! We are talking about INNOVATIVE WAYS TO USE A PAINTER’S DROP CLOTH IN DECOR. Wow, do we have suggestions for you! Drop cloths are cheap and give us lots of great neutral material!!!! Or you can listen to any or all of the DTT episodes HERE. Let’s layer rugs like a pro! No matter what you have on your floors you can layer rugs! But layering works best on a hard surface floor such as wood and tile. It will also work just fine on very low nap carpeting. But don’t be discouraged, if you have carpeting with a higher pile you just have to know how to choose the right rug to layer! Choose a heavy flat rug. Jute is perfect! Just like the “rules” for laying a single carpet in a room… the bottom layered carpet should also abide by them too! Now, these rules are really only suggestions. Following them will help a room look styled and cohesive. However, don’t be afraid to bend the rules a little! 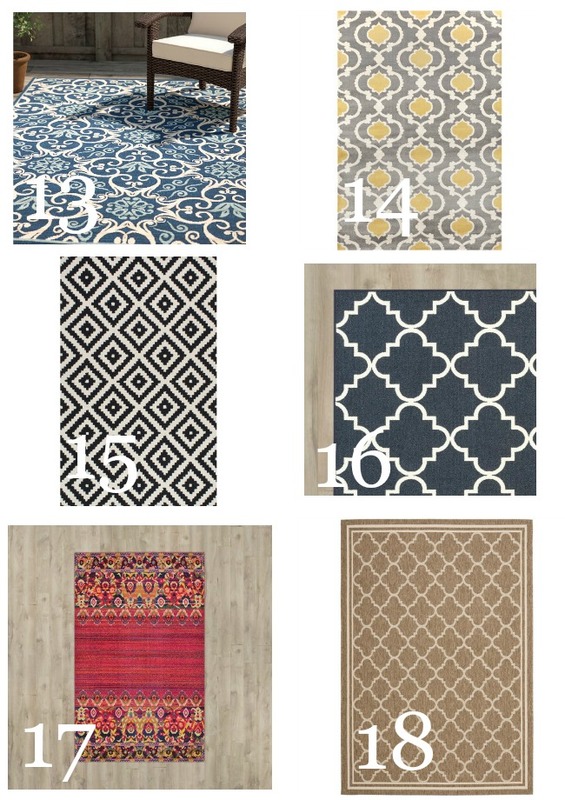 Choosing a rug and its placement is a personal decision! You want a room to exude your personal style and personality! When layering wall-to-wall carpeting think of it as your bottom layer. 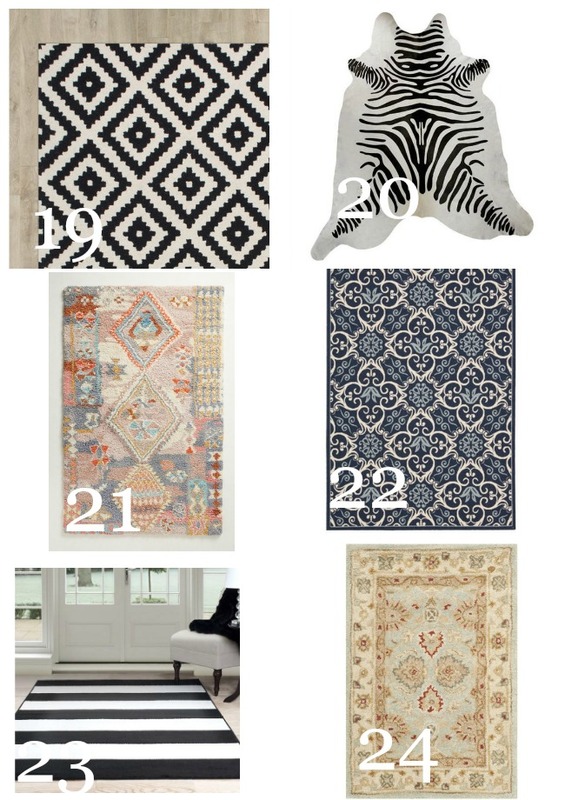 Choose one great rug to layer over the top! 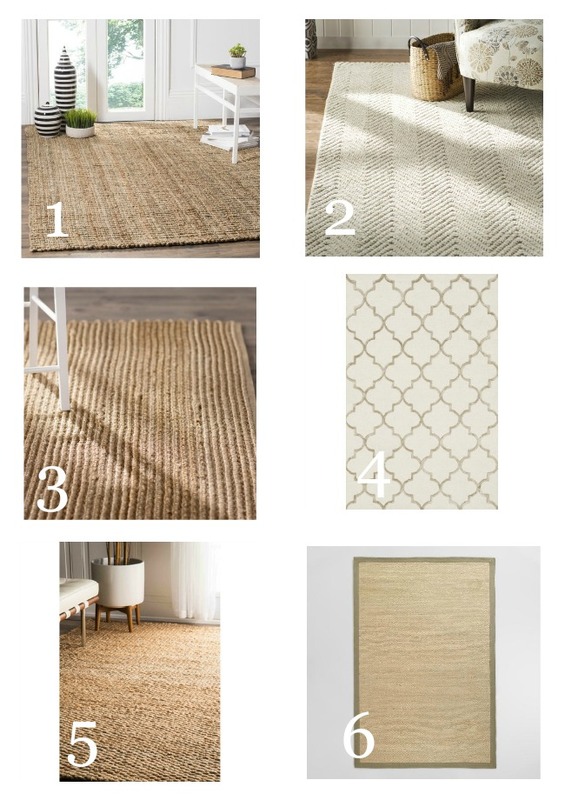 For me, the best and easiest way to layer rugs is to start with a jute rug on the bottom. It is a blank canvas that brings lots of texture and nubbiness to a room! And you can find a jute rug for a very reasonable price! If jute is not your thing, try layering a solid color or large geometric with lots of “open” space for your bottom rug. The bottom rug should not be too busy! I can go either way on fringe or no fringe for a bottom carpet unless you are layering it over wall-to-wall carpet. Then I say no fringe. You will want to keep the rug very tailored. The great thing about the top rug is that you can mostly do what you love! Get creative! This is a good place to use your small Oriental or tribal rugs. They will look very updated when layered with a natural woven rug. 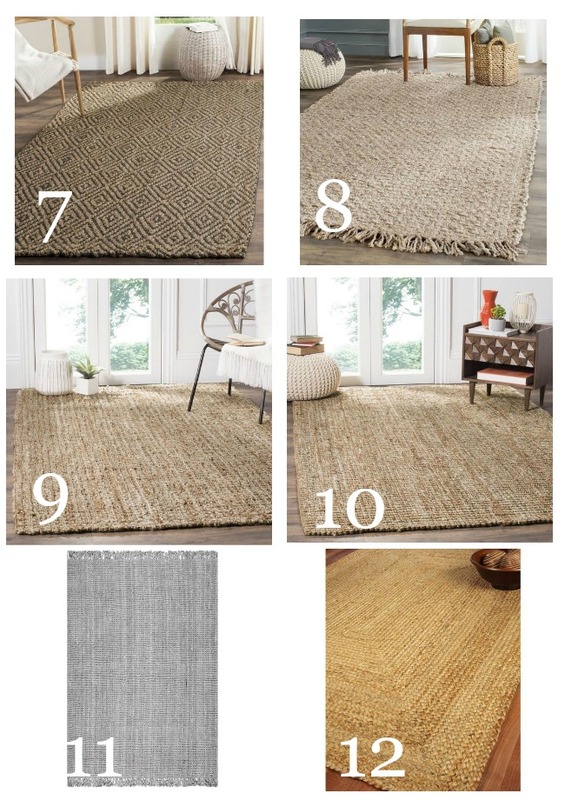 Here are some bottom layer jute rugs I’ve found for you. Each rug comes in many sizes. Rug 1 is my family room rug and rug 5 is my living room rug. To hear more about rugs and layering rugs listen to Decorating Tips And Tricks LET’S TALK RUGS. We even have a couple funny stories to go along with all the tips! Now you know how to layer a rug so get busy!!!! Layering rugs can add so much warmth and style to any room! 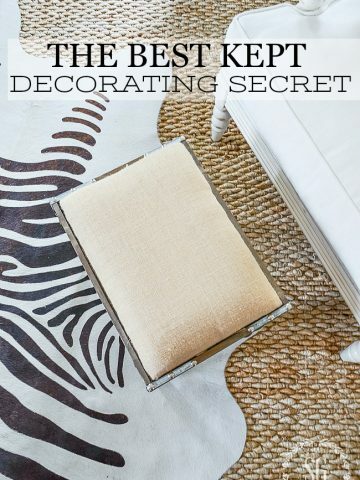 Ive seen this room in some of your previous posts and wondered about the layering of your hide rug and loved the jute rug. 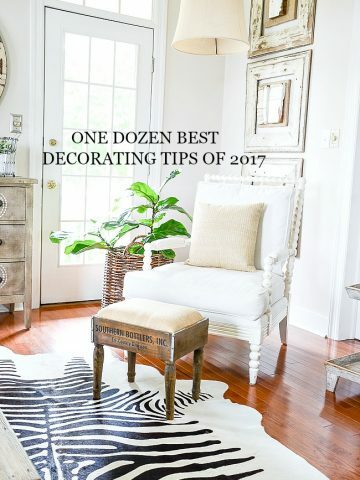 Thanks for sharing your decorating tips on this with your readers. We own a log cabin and I have often thought I’d like to have a faux bear rug but was never bold enough to try it but I am now inspired to buy it as well as a jute rug and work it into my living room near my fireplace. Love the room and your blog which I just discovered. Could you tell me where you got your beige chest and the painting above sofa? It’s amazing how much more put together the room looks by adding the larger rug. No matter how beautiful the floors are, the layered look really adds something special to the overall look. Great post, Yvonne! I never would have thought of lAYERING RUGS THIS WAY. I WANT TO TRY THIS IN MY GUEST ROOM. I saw above my question. Does it (jute) leave a lingering odor like jute rope? I am new to your blog. Love the layering of rugs. Thank you for adding pics. on what is possible using area rugs. Very helpful. Thank you for the pics before and after and it makes sense and I like it a lot. You are good Yvonne! Yvonne,I love all great tips on layering rugs. I have a jute rug that tends to slide around on our floor in our summer kitchen. My husband came up with the idea of putting a bead of latex chaulk on the back of the rug and now it doesn’t slide. Yah no more slipping and sliding. GREAT tip, Theresa! I use a non slip rug pad under mine. I love jute rugs, and never thought of layering them! 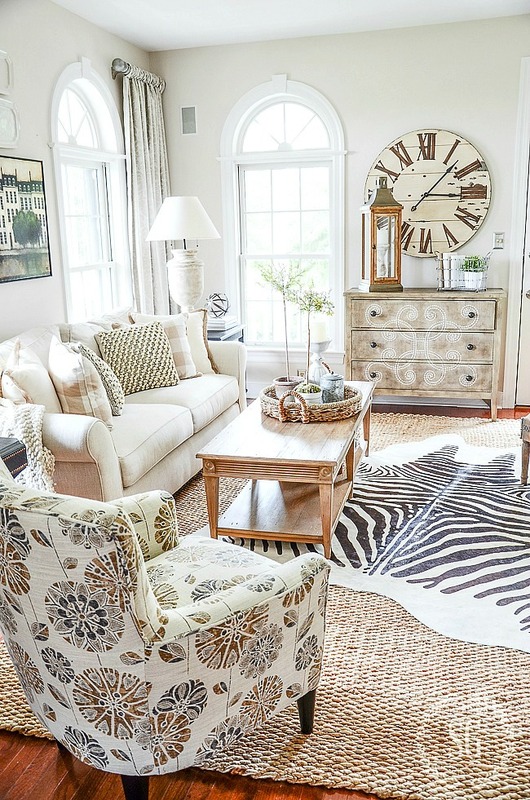 Your living room was beautiful before, but putting that rug down makes it look even better! The great thing about jute rugs is they go with absolutely any style, and they’re neutral so it will go with any color scheme. They just warm up the room. Great tips Yvonne! I love your jute rug Yvonne. It really makes your living room look pullled together. I ordered one for my living room last year before my new furniture came and I too love it. Your living room is completely transformed with the new bottom rug. It was nice before, but the hard, shiny floor drew your eyes down and filled your vision with the many, many legs on your furniture. This rug allows your eyes to see the furniture itself, not just the legs. And it warms the room so much. I’m sure the rugs you’ve put in other areas of your home will do the same. Good post – thanks for sharing. 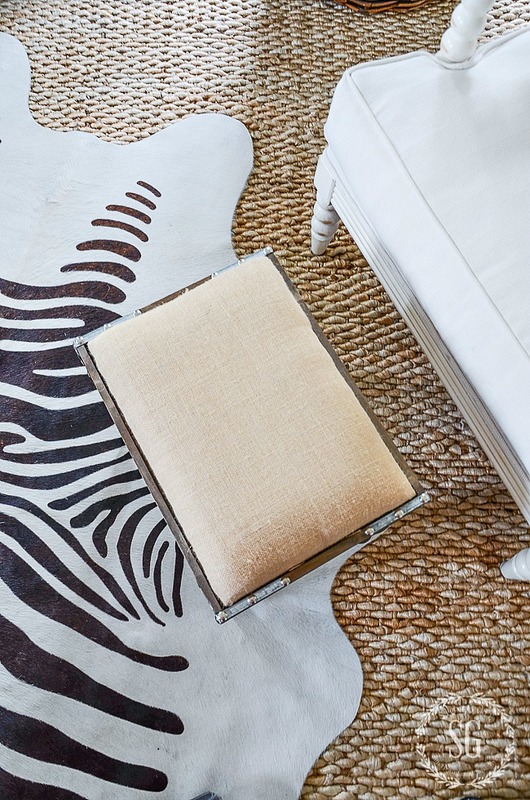 The nubby texture of the new rug added an amazing and “finished” look to your room! It looks so very soft…is it? 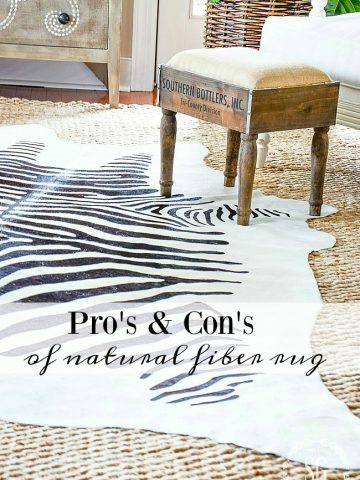 Since the link did not indicate what fibers were used in the rug, can you share that with us? I was interested to know if it sheds, also. It is quite lovely and stylish. Great choice. Hi Bunny. The rug is nubby but it is a soft texture. Not scratchy or rough. Hope this helps. Great tips! Now I know what to do when I want a rug change. A couple of questions about your living room rug…does it shed? Does it smell? You know how jute rugs carry an odor sometimes? I have a Frenchie and a Boston Terrier and just wondering how the rug would handle if there’s an accident or if it pulls easily. I have a sisal underneath my kitchen table and it’s worn well, but it carried an odor for a long time. 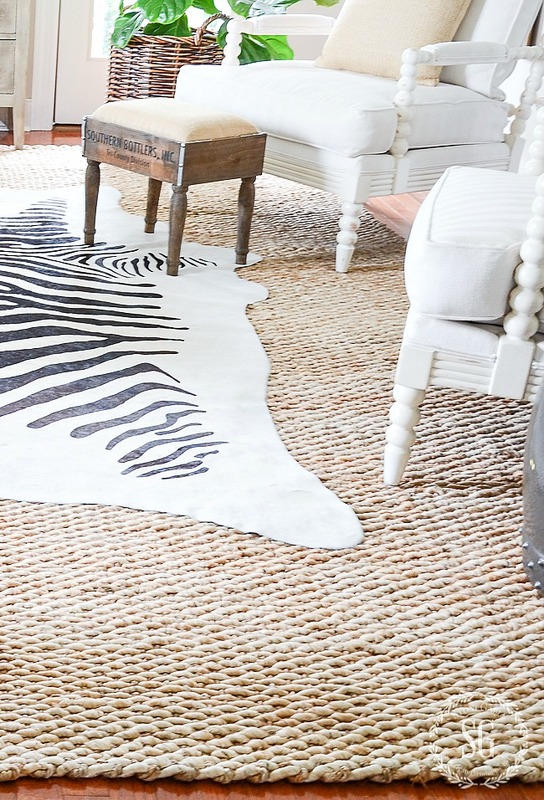 I really love this rug and would love to order it for my family room! Thanks in advance for your help! 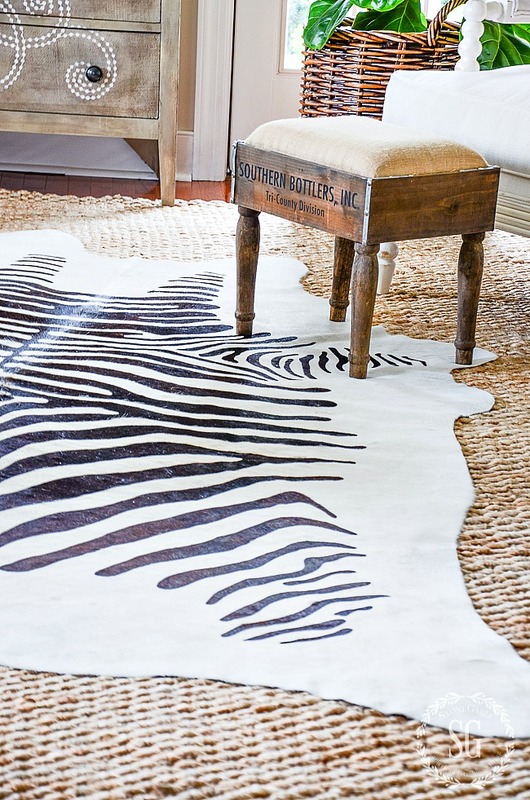 That zebra rug just shouts character. Forgive me if you already shared, but where did you find it? I love your Jute rug! Does it shed? And how does it feel underfoot? I have a sisal rug that I love except for the shedding. If you have dark pants on don’t even think about sitting on the floor! I really enjoy your blog, especially talks about our Lord. That was very informative. Thanks Yvonne! Good to know about the jute rugs and the same rugs on a open floor plan. I just put a new rug under my kitchen table and was wondering what to do with my kitchen rug. I think I have made a decision. Lov the layering and how the jute rug contrasts against the wood floors. Great tips. I love the look of the jute rugs on the wood floor. Loved this segment. I have a question – what do you do when you have an open floor plan and hardwood floors and want a rug under the living area and dining area – do you use the same rug for both areas?? I have he same situation. 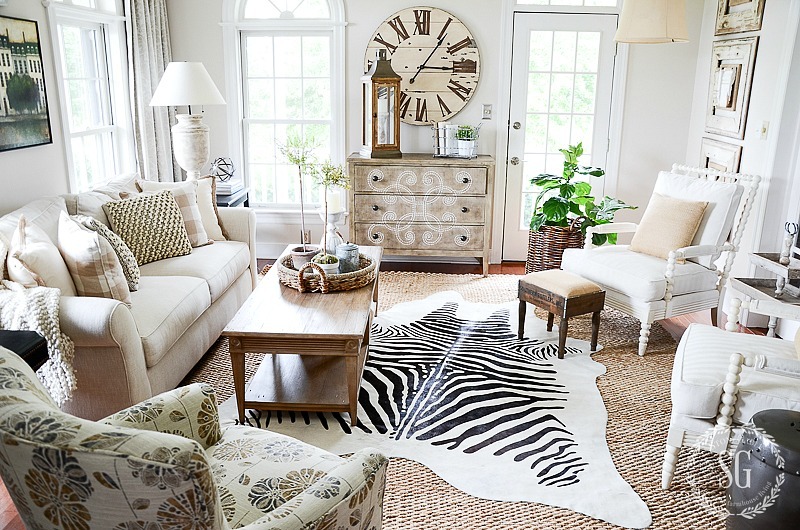 Looking forward to your post on coordinating the transition with multiple rugs. I have that same issue, Vicki. My living room, dining room and foyer are all connected. I ordered another jute rug just like the one in my living room to layer in the foyer and I am leaving my dining room rug as it is for now. 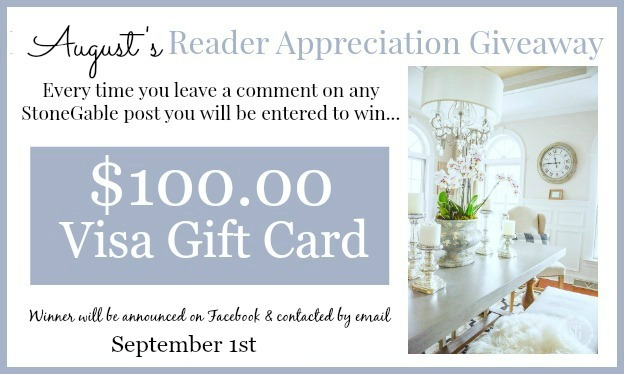 This is such a great question I’ll do a post about your question when the rug for my foyer come in. Hope this helps a little until then. The layered look, looks great in your room! I recently was given a cowhide rug from my in-laws (yeah! ), and was wondering if you have any suggestions on flattening the center fold? The rug doesn’t lie completely flat and it not only bothers me, but I’ve tripped over it a couple times already. Love your family room, the layered rugs look great. You have the best tips and I am still learning from you. Thanks for sharing and enjoy your day. Amazing how layering changes the whole look of a room! This is a fantastic post – I have learned so much – thanks for sharing. LOVE to hear that Anne Marie! Love how the jute rug toned down the brown in the wood floor. The remaining accent of the wood floor appears to be a frame around the artful arrangement of the room. Hear the jute rugs calling me. It really did Carol. And I think the jute rug brings the furniture together.